Ekklesiyar Yan’uwa a Nigeria (EYN) Standing Committee has commissioned a seven-member Crisis Management Team (Team in what follows) to coordinate the church’s response to the overwhelming disaster that has engulfed EYN, especially in northeast Nigeria. Though the disaster has been years in developing this year, 2014, has been an especially difficult year for the church. In April, Boko Haram abducted over 300 women students, 170 EYN, from their school in Chibok. Through the summer there were more attacks by Boko Haram in EYN areas of Borno, Ademawa and Yobe states. Then October 29th the EYN headquarters and Kulp Bible College had to be evacuated as Boko Haram ransacked Mubi and the surrounding area. In August, Jay Wittmeyer and Roy Winter of the Church of the Brethren (COB) met with EYN Standing Committee and drew up a detailed response plan to the crisis. By November, though the framework of the plan remained valid, the crisis had grown immensely. Carl and Roxane Hill, Co-Directors of the Nigeria Crisis Response were in Nigeria encouraging the process as the Team members were selected and Standing Committee commissioned them for the work. It wasn’t just a simple two-step plan that confronted the Team. 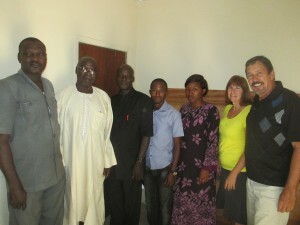 Their task included: 1) providing emergency feeding for tens of thousands of displaced, with a focus on EYN families, but recognizing the need to assist others where populations are mixed; 2) selecting leadership to carry out/coordinate an extensive trauma healing process for the church; 3) assisting with the re-establishment of an EYN headquarters, for this time near Jos, and a new setting for Kulp Bible College on EYN land; 4) organizing the return of thousands of EYN members from the refugee camps and the mountains of Cameroon; 5) settling refugees who would not return to their original homes onto newly purchased locations with homes, school, clinic and place of worship; with the intent 6) of quickly moving formerly displaced families from a dependence on emergency food to a position of being able to sustain themselves through jobs and farming; 7) expanding the peacebuilding work of EYN; and 8) carrying out regular advocacy with embassies and other potential partners in the relief efforts. Implicit in this relief task was the vision to grow EYN as a national and international church. Developing the headquarters annex moved the center of the church to a location more easily accessible to the rest of Nigeria and neighboring countries. With Kulp Bible College near by that central accessibility for leadership training also holds true. When the return to Mubi is possible these new developments provide for increased opportunities for church growth. In December both the COB and Mission-21 (formerly Basel Mission) made initial commitments to be partners with EYN in this immense undertaking. Mission-21 has been sending mission workers and financial support for EYN since Basel Mission merged with EYN in 1962, so this partnership is just a more explicit commitment to support the response to this disaster. One of the complicating factors for this three-way partnership is that the disaster continues with no indication that it might not grow. Support from the Church of the Brethren is essential. Major fundraising will be required and many volunteers will be needed to walk with EYN in this process. It is a massive undertaking for all three of the partners. The three-member Brethren Disaster Ministries (BDM) team and the four-member Mission 21 team ate breakfast early to head out to the building project site of the Lifeline Compassionate Global Initiatives (LCGI). LCGI is an interfaith nonprofit focusing presently on this effort to house those displaced by the attacks of Boko Haram in northeast Nigeria. Samuel Dali, who participated in the dedication and is President of Ekklesiyar Yan’uwa a Nigeria (EYN), estimates that as many as 170,000 EYN members may be presently displaced from their homes as a result of the conflict ravaging northeast Nigeria. But many other Christians and many Muslims are also displaced by that fighting. So Marcus Gamache and the LCGI committee have been building relationships, buying land, registering the 63 families and 394 people with the Nigeria security office and securing funding so that today’s dedication service could move ahead. Those are the families and the people who will settle this newly-purchased farm land. The community will lie on the edge of the rugged foothills of the mountains on the north edge of Abuja, the capitol of Nigeria. One might assume that since Boko Haram says it is Muslim, displaced EYN members might not welcome a home next to a Muslim family. But this interfaith planning group has realized that building good relationships across faith lines is one way to break down those animosities that lead to war. BDM and Mission 21 have funded and encouraged the efforts of LCGI. A line of men and women, some of the ones who will soon move into these homes, carried blocks from where they were formed down the road to the first home where they became the foundation. A bore hole will be dug this next week to provide the water needed for this large construction project. Marcus estimates that the community of homes should be completed by March. Four EYN pastors and their families are among the new settlers. A worship center for Muslims and one for Christians will be part of this new community. Spiritual undergirding will be essential for this new beginning. This is a small start with thousands of people yet to settle temporarily or permanently, but the LCGI committee trusts this site can supply a model that will inspire others. The riches of God are new every morning.